Take one (1) tablet daily with a meal, or as recommended by a healthcare practitioner. 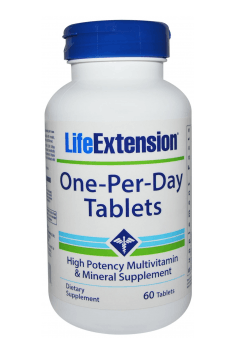 This complex of vitamins and minerals is particularly recommended for seniors, athletes and everyone who wants to supplement deficiencies, especially in winter, when access to the natural forms of microcomponents is limited. It is highly recommended that supplementation is accompanied by a proper diet, including hydration: at least 3-4 litres of clean water a day. That is because the product contains both fat- and water-soluble vitamins. A blend of natural forms of vitamin E. Delays the process of cell aging. Supplement with iron, folic acid, and vitamins. It improves oxygen transport in the blood and muscles. Unique formula designed to strengthen connective tissue. Helps to increase mobility. Gingko biloba leaf extract. It has a beneficial impact on memory and cognitive functions. Supplement with magnesium oxide powder. It has anti-stress and antidepressant properties. Complex probiotic preparation, addressed to children below the age of 2. Vitamin A (retinol) is present in foods of animal origin (fish of the sea, fish, eels, liver, pork and beef, eggs, butter). In the plant products it is present as provitamin A (b-carotene), a powerful antioxidant. The food products containing pro-vitamin A are fruits in yellow and red, including apricots, tomatoes. Necessary in process of building and assimilation of proteins, affects the normal growth of bones and helps the treatment of eye diseases.Iinhibits the excessive action of the thyroid hormone - thyroxine, which simultaneously prevents the deposition of excess vitamin A. Necessary in the sports diet of in the form of food, such as dietary supplements and nutritional supplements. Vitamin A deficiency causes growth inhibition, flaking and dryness of the skin, impaired night vision (i.e. Night blindness). Dosage: Specified in IU and it is 5000 IU per day. Beta-carotene (provitamin A) is a fat-soluble form of vitamin A (retinol). It is a necessary vitamin for the development and acquisition of proteins, necessary to rebuild a bone structure. Irreplaceable in the treatment of eye diseases (prevents decrease of vision and so called night blindness). It strengthens the immune system. It is a strong oxidant. In its natural form it can be found found only in plants (unlike retinol, which is present in foods of animal origin) such as chard, squash, kale, carrots, apricots, tomatoes). Available in the form of supplements and nutrients as an essential component of the sports diet. Vitamin D belongs to fat soluble vitamins, occurs in three forms: calciferol (vitamin D1) ergocalciferol (vitamin D2) and cholecalciferol (vitamin D3), it is formed under the action of sunlight for at least 15 minutes per day. In the absence of sunlight it should be administered in the diet in the form of fish oil (Vitamin A + D3) and fish oils. It is responsible for the absorption of calcium and phosphorus. It is the building substance of bone tissue particularly necessary during pregnancy, childhood, and for athletes. It is a component of dietary supplements and nutrients among competetive athletes. Deficiency of vitamin D causes children growth inhibition, and rickets. For adults - deficiency causes osteomalacia. Excess of vitamin D causes headaches, alopecia, nausea, drowsiness, blurred vision, pain in the long bones, the deposition of calcium deposits. Dosage: 400 IU units during the day. Vitamin E (tocopherol) is a fat soluble. Due to its antioxidant action, it is a protection of other vitamins (e.g. Vitamins A). Protects the body against free radicals, strengthens the walls of blood vessels and its capacity, causing their dilation and dissolution of blood clots. With the reduction of coagulation, it is used as an antiatherogenic medicine, it allows for the proper course of pregnancy. In cooperation with selenium it slows the ageing process of cells, strengthening connective tissue. In the food it is present in whole-grain bread, sprout and grains, vegetable oils (soybean, sunflower), soya beans and sunflower seeds, vegetable fat and hen egg yolks. Also it is used in sports medicine in the form of nutrients and supplements. Vitamin E deficiency reduces building of red blood cells, results in changes in muscle and disorders of pregnancies. Dosage: for children, 0.5 mg / 1 kg of weight; for adults 10-30 mg per day. D-alpha-tocopheryl succinate is a natural form of fat-soluble vitamin E that is one of the strongest antioxidants. The source of vitamin E is very significant because synthetic forms are characterised by much lower bioavailability. Unlike natural forms (d-alpha-tocopheryl succinate, d-alpha tocopheryl acetate and etc. ), synthetic compounds are designated with the prefix “dl” (e.g. dl-alpha-tocopheryl succinate that is a completely synthetic form). Depending on the condition of the body, the absorption of natural vitamin E may vary from 20 to 70%. In comparison with alpha-tocopherol, alpha-tocopheryl acetate and alpha-tocopheryl nicotinate, it is believed that d-alpha-tocopheryl succinate is the most effective form of vitamin E, especially when it comes to anti-cancer effects. Vitamin E as d-alpha-tocopheryl succinate is a frequent ingredient of vitamin-mineral supplements which promote general health of the body and adds vitality. D-alpha-tocopherol – a natural form of vitamin E which is indicated as the most optimum for supplementation. It helps correct effectively deficiencies of this compound which is extremely crucial for the human body. Vitamin E is a very important bioactive substance found in many tissues and required for normal functioning of the body. Its deficiencies may be manifested by impaired cognitive abilities and vision, muscle weakness and infertility. It is involved in erythropoiesis and that is why its low intake may lead to anaemia. In addition, vitamin E has an important role as an antioxidant in the human body. It has the ability to reduce the amount of free radicals, thereby decreasing negative oxidative stress. During supplementation with d-alpha-tocopherol, we should remember that it belongs to fat-soluble compounds, along with vitamin A, D and K. Because of that, supplements with vitamin E should be taken with a fat-containing meal. Vitamin B2 (riboflavin) is soluble in liquids, is involved in the metabolism of proteins, fats and carbohydrates. Required for growth of the organism. Takes part in the production of erythrocytes (red blood cells). It is located in natural foods, such as yeast, meat (especially liver, kidney, heart), milk, fish and green leafy vegetables. A deficiency of vitamin B2 inhibits the growth, diseases of the mouth, loss and greasy hair, seborrhea and stratification of nails. Increases skin roughness and susceptibility to acne and oily skin. Dosage: 1-2 mg per day. Pyridoxal 5-phosphate (P-5-P) - the form of vitamin B6, called coenzymatic, considered the best assimilable form of this vitamin by the human organism. This is related to direct metabolic activity of pyridoxal-5-phosphate in the human organism. It does not have to be subjected to biochemical transformations in the organism in order to be able to enter metabolic pathways as a biologically active ingredient. Vitamin B6 is an incredibly important factor regulating the work of many processes in the organism due to its role in the organism as a coenzyme, essential for the activation of many important enzymes. Thanks to this, it regulates metabolism at many levels and its proper supply is conducive to maintaining homeostasis of the organism. Another aspect of effectiveness of vitamin B6 is its influence on the normalization of emotional states. It is conducive to relaxation, facilitates falling asleep and falling in a deep, the most valuable sleep. Special influence on P5P on the psyche is proven in women before menstruation, as it demonstrates considerable ability to reduce the symptoms of the pre-menstrual syndrome. Supplementation with vitamin B6 also demonstrates positive influence on the functions of the nervous system. It is conducive to the nourishment of neuronal tissues and optimizes the secretion of neurotransmitters, thanks to which it promotes nervous transmission and demonstrates neuroprotective properties. It was proven that vitamin B6 may decrease the risk of developing Parkinson’s disease. Some sources also suggest the ability of pyridoxal 5-phosphate to reduce the risk of cancer. This effectiveness is noted especially in relation to breast cancer. Folic acid - also known as vitamin B9, is a synthetic form of naturally occurring folates. It needs to be transformed to folates in order to be biologically active also in the human organism. Therefore, its supplementation is recommended to people who do not have problems with methylation processes. The majority of people associate folic acid with the period of pregnancy. It is definitely a justified association. Proper supply of vitamin B9 conditions correct development of the fetus and prevents disorders of neural tube defects in a baby. Supplementation with folic acid also demonstrates positive influence on the functions of the nervous system of adults. Some sources say that it is conducive to maintaining beneficial emotional states. Moreover, folic acid takes part in the process of erythropoiesis, thanks to which it enables efficient production of red cells. Supplementation with folic acid should be also considered by men who deal with low sperm quality. It was proven that complementing the level of vitamin B9 is conducive to increasing reproductive abilities of men. 5-methyltetrahydrofolate (5-MTHF) is a methylated, biologically active form of folate. It is especially willingly used by people with folic acid metabolism disorders, especially by polymorphisms of the gene coding the production of methyltetrahydrofolate reductase. Using this form allows to skip narrow gorge created by this polymorphism and enjoy all effects induced by folates. It is also a good substitute for synthetic folic acid (pteroylmonoglutamic acid), which in clinical trials demonstrates the ability to increase the frequency of developing cancers. Folates, also called vitamin B9 have a wide contribution to the development of the nervous system. They contribute to converting homocysteine to methionine and then to s-Adenosyl methionine, which is the main donor of methyl groups. Thanks to this, the condition of the circulatory system is increased, as the amount of pro-inflammatory homocysteine is decreased and the intensity of the production processes of creatine and neurotransmitter synthesis is higher, which is reflected in the reduction of fatigue and better psychological condition. 5-MTHF in mono-supplements and complex vitamin preparations may be found in the offer of muscle-zone.pl. Methylcobalamin is a biologically active form of vitamin B12. It is one of the two forms of this vitamin that may be used as cofactors in various reactions. It differs from popular cyanocobalamin in the presence of methyl group instead of cyanide, thanks to which it releases the organism from the need of neutralizing this harmful factor. The methyl group from methylcobalamin may be transferred to homocysteine, thanks to which it comes back in the form of methionine in order to be further converted to SAMe, which is the main donor of methyl groups in our organism. These methyl groups may be then used in the processes of creatine production, in neurotransmitter metabolism and as DNA methylation, thanks to which we achieve proper energy level, better well-being and generally better condition of the organism. B12 is a coenzyme for three enzymes: isomerase, methyltransferase and dehalogenase. Apart from the influence on the nervous system, the supply of vitamin B12 is also very important for the proper synthesis of red cells as well as hemoglobin and anemia prevention. Methylcobalamin in mono-supplements and complex vitamin preparations may be found in the offer of muscle-zone.pl. Biotin (vitamin H, co-enzyme R) is in a group of B vitamins, due to the presence of sulphur compounds it is involved in the synthesis of ascorbic acid (vitamin C). Also synthesized in the intestines. It enhances the production of hormones and regulates cholesterol levels. It reduces muscle pain. It prevents hair loss and graying of hair. It soothes the skin inflammations. No toxic effects. Often combined with other B group vitamins and vitamin A. The natural sources of biotin are: whole grain bread, yeast, eggs (yolk), milk, brown rice and cheese. Vitamin B5 (calcium pantothenate, pantothenic acid, pantotenol) is part of a complex of B vitamins affects the development of the central nervous system, is the building substance of cells. In the body synthesized by the intestinal bacteria. It occurs in animal products (meat, kidneys, liver) and plants (wheat germ, wheat bran, nuts, grains, green vegetables). Prevents fatigue and excessive stress, accelerates the healing of cuts and wounds, acts as a stimulant for the side effects of the use of antibiotics. Deficiency causes skin changes, and difficulty in blood clotting. Calcium panthonenate – a salt of pantothenic acid and calcium used to raise the intake of this first substance, belonging to a group of compounds called vitamin B5. It is active in many biochemical processes in the human body as an extremely important factor for maintaining homeostasis. Adequate intake of pantothenic acid helps maintain healthy metabolism of nutrients and obtain easily energy from them. Deficiencies of this compound may be manifested by chronic fatigue and lack of strength, especially in physically active persons. What is more, pantothenic acid is present in the synthesis pathway of many vital hormones. Because of that, its sufficient supply is critical to hormonal balance. Testosterone is one of the hormones that are affected by pantothenic acid intake. Because of that, its deficiencies may have a negative effect on sexual function. Pantothenic acid is also indicated to have a cardioprotective effect. It helps maintain normal cardiac function and reduces the risk of atherosclerosis by optimising the lipid profile. Iodine - more than two-thirds of iodine is stored in the thyroid gland and it is a component produced by it hormones - thyroxine and triiodothyronine, which are essential in the metabolism of proteins, carbohydrates and minerals and regulating the processes of growth, causing it usefulness in sports supplementation. It is also the ingredient of weight loss products. Regulates and controls body temperature. Natural source of acquisition of iodine are: bladderwrack, seafood, sea fish and onion and vegetables growing in soil containing this element and most of all iodized salt .. Deficiency of iodine in the body cause hypothyroidism, and consequently overweight, mental slowing (cretinism inclusive). It is the cause of a goitre. Iodine deficiency can be caused by rhodanates and polyphenols (e.g. contained in cabbage and cauliflower), hemagglutinin found in legumes. Excess iodine can result in inhibition of thyroid hormone synthesis (this happens in a small percentage of cases). Dosage: Treatment of iodine should be done under medical supervision. Daily demand for adults is 150 mcg. For pregnant women daily demand increases to 175 mcg. Zinc (chemical element from transition group 12) belongs to the trace elements, it helps maintain acid-base balance of the body, protein, energy, lipid and carbohydrate metabolism. It provides bone metabolism and transport of oxygen. It protects the body against free radicals. Necessary for the proper operation of the senses of taste and smell. Positive impact on the process of insulin metabolism in the pancreas. It supports visual adaptation to the dark, has a significant influence on brain function. It is helpful in the treatment of infertility and mental illness. Zinc deficiency leads to decreased immunity, and growth retardation. Zinc deficiency can occur in case of excessive consumption of simple sugars. In the case of hormonal therapy of women with irregular menstruation, the therapy should be associated with increased consumption of zinc. It can be found in food like: beans, eggs, carrots, beef and pork meat, milk, nuts, citrus fruits, seafood, rice, cottage cheese, lettuce. Dosage: Daily 12-15 mg zinc. Exceeding the daily dose of 20 mg cause symptoms of poisoning of the body. Zinc citrate - an organic form of zinc with very good assimilability and bioavailability. In one molecule of zinc citrate, zinc ions constitute 34% of the compound’s mass. Therefore, 100 mg of the substance will provide 34 mg of zinc ions. It should be borne in mind when buying dietary supplements, in which only the mass of the whole compound in a portion is provided. Supplementation with zinc in the form of citrate in some people may cause ailments of the digestive system - nausea, appetite drop or stomachache. Zinc in the form of zinc citrate should be best taken between meals, due to the fact that many food products may limit the absorption of this element, especially products rich in phytates, dairy products or fiber. Zinc monomethionine - zinc in an innovative form of amino acid chelate, which is the combination of zinc ion with the molecule of methionine. Supplementation with zinc in the form of chelate brings many benefits, as this combination is stable and well-assimilable by the organism. Some data suggests higher ease of permeation through intestinal walls and better absorption of zinc in the chelated form. Methionine is the easiest absorbed amino acid by the organism, which contributes to good bioavailability of the connection of this compounds with zinc. Zinc monomethionine is the component of the popular supplement ZMA, which is the combination of zinc, magnesium and vitamin B6. Zinc in the chelated form may disturb the assimilation of antibiotics from the group of tetracyclines and quinolone antibiotics (e.g. ciprofloxacin). In this case, the antibiotic should be taken 2 hours before or after the application of zinc monomethionine. Manganese, of which a natural source is chocolate, grain products with whole grain, nuts, legumes and dried cranberry, is a component of enzymes and their activator. It stimulates the properties and functionality of connective tissue and provides proper functioning of the brain. It affects the function of the pancreas, ensuring proper insulin metabolism and condition of the bone and joints. Magnesium deficiency contributes to serious disorders in synthesis of hyaluronic acid and chondroitin, reduction in insulin sensitivity of tissues, affects bone resorption. Manganese chelates are used in complexometry in chemical analysis and in medicine for the treatment of severe poisoning (antitoxin) by heavy metals, in sports supplementation, manganese impact on the functioning of the locomotor system is used. It is a component of the so-called regenerators of joints and a vitamin-mineralizing and mineralizing supplements. Chromium (chemical element from transition group of the chromium, chemically active) is actively involved in the metabolism of fats and carbohydrates. It comes in the easily assimilable organic form and inorganic. Along with insulin, as a component of the glucose tolerance factor (GTF), is used in insulin-dependent diabetes treatment, insulin involved in the metabolism of glucose in t proteins transport. Activator of enzymes involved in the metabolism of fats and cholesterol. Available in animal origin products (liver, veal, chicken, turkey meat, oysters) and plant-origin (bananas, broccoli, cereal, wheat germ, spinach). Supplements containing chromium are recommended for fat loss (also thermogenic), and improving the functioning of the body. The sports supplementation used chromium in the form of mono-preparations or in the form of vitamin-mineral minerals supplements. Chromium deficiency results in impaired glucose, reducing the insulin sensitivity. It causes a decrease in immunity and endurance of the body. It may be a cause of coronary heart disease. Sometimes it causes neurological disorders. Dosage: A varied diet prevents from the deficiency of chromium in the body. Dosage: The recommended dose of 50-150 mg per day. Molybdenum (the element of the chromium groups, atomic no. 42, a chemical symbol Mo) - a trace element involved in the metabolic conversion of carbohydrates and fats and increases the absorption of iron. It is used to treat anaemia. Well affects the mood.. It is a component of many dietary supplements and in foods such as lettuce, cabbage and other leafy green vegetables, whole grains (corn, sunflower, etc.). Inositol is an organic compound from the group of B vitamins soluble in fluids, present in the natural or synthetic form, synthesized in plants, such as brewer's yeast, beans, grapefruit, cabbage, sprout of wheat, melons and animal (liver). Along with choline is included in the lecithin. It affects the cell nutrition of the central nervous system (brain) by reducing the level of LDL (bad cholesterol), this makes it applicable in treatment of Alzheimer's disease and atherosclerosis. It has a calming effect. There has been a beneficial effect of inositol on the skin and hair reported. ALA (alpha-lipoic acid) is a vitamin-like substance, a metabolite of catecholamines with strong antioxidant properties, it enhances anti-free-radicals action of some vitamins (A and E). ALA is synthesized at low levels by the body. It is a component of such products as broccoli, yeast, chicken liver, spinach. In the medicine it is used in the prevention of diabetic neuropathy (tissues shows a sensitivity to the insulin hormone, and it stimulates blood sugar levels). It has a positive effect on the functioning of the circulatory system and heart by the anti-arteriosclerosis action. It improves transport of creatine. It affects the storage of glycogen in muscle and liver. Antioxidant properties of ALA are used in sports supplementation, along with the assimilation of nutrients. ALA is found in the form of mono-formula and is a compound of multicomponent products as: amino acids, creatine nitrogen boosters, as well as insulin-like (insulin-mimetic substances). Mixed tocopherols - a method of complementing vitamin E, commonly used in supplementation, encompassing tocopherols and tocotrienols. The compounds from the group of vitamin E belong to the substances soluble in fats, therefore they should be taken with fats. The main activity of vitamin E in the organism is its activity as antioxidant. It demonstrates the ability to neutralize free radicals and consequently to reduce oxidative stress. In this way, it positively influences the state of tissues of the organism. Supplementation with antioxidants is indicated as an effective method of delaying the signs of aging and it may demonstrate anticancer properties. Apart from this, supplementation with vitamin E, thanks to its antioxidant properties, positively influences the absorption of some other biologically active compounds. Supplementation with vitamin E also demonstrates cardioprotective properties. Its proper concentration in blood prevents the pathological breakdown of erythrocytes, increases endurance of blood vessel walls and decreases the risk of developing atherosclerosis. For maximal absorption and effectiveness, vitamin E should not be used with vitamin K and supplements containing iron. Lutein, a derivative of alpha-carotene is a natural plant dye, colouring in yellow, is also present in the yolk of egg. In the body, located primarily in the retina of the human eye (together with Zeaxanthin), it acts as a natural filter for the eye, absorbing ultraviolet radiation. It is a powerful antioxidant, neutralizing free radicals. Available in the form of mono-preparation supplements and multi-compound supplements with antioxidant, protecting the eyes, action, as well as multivitamins, creatine stacks and no-boosters. Zeaxanthin is a natural plant dye, a compound classified as carotenoids found in foods of plant origin, essential for the proper functioning of vision. Located on the retina, the so-called. yellow macula, it is responsible for visual acuity. Together with lutein (belonging to the carotenoid) it is an antioxidant, also it has the ability to absorb energy of blue light protecting eyes from organ damage. Zeaxanthin is a component of formulations (often in combination with other carotenoids) enhancing the functioning of the organs of sight. Dosage: Up to 2 mg per day. Boron - an element of boron group, symbol B, atomic number (Z) - 5, belongs to a group of micronutrients. The organism, it is responsible for the synthesis of nucleic acids and prevents the release of excess calcium from the bones. Is an activator of enzymes in metabolism. It occurs naturally in citrus fruits (grapefruit, bitter orange), legumes, grapes, malt beer. The supplementation is rarely used, mostly in vitamin and a vitamin-mineralizing supplements. Dosage: the lack of standards for daily consumption. Excess of boron is toxic for the organism.